You’ve been hired as a nanny by a wonderful family. The children run to you when you arrive and cry when you leave. The parents trust you and praise your skill and wisdom. This is the nanny job of your dreams. A few mishaps can turn your idyllic world into a nightmare. However. If you want to build the best possible relationship with your nanny family, there are several things that you should always do and a few things that you should avoid like the plague. I can not emphasize this enough. Please respect the private lives of the families you work for. No one wants to hire someone they can not trust. Would you want to be friends or continue to be friends with someone who goes about sharing private details they know about you? The Answer is no! Maybe your employer doesn’t wear pants around the house, or you accidentally found out what the parents keep in that locked nightstand. Perhaps you walked in on an intimate argument between the mom and dad. Don’t share the details with your friends, online or in person. Consider your relationships as hush-hush like the one between a doctor and patient. Some families make their employees sign a confidentiality agreement. If you want to build trust, present your families with your non-disclosure contract. Explain that you’ll certainly never reveal any details about their personal lives, and you’ll sign the agreement to show just how serious you are about that. There are many ways in which social media can ruin your nanny reputation. First of all, if your employer follows you, she’ll notice if you’re posting statuses while you’re supposed to be watching the kids. You lose even more points for posting about your charges without permission. Many experts recommend that you don’t post information about children online. It’s a violation of the children’s privacy. Child predators may stalk social media pages to find out where kids hang out. Some criminals steal pictures of kids to post on less-than-reputable internet sites. If you’re thinking of sharing your charge’s adorable rendition of “Uptown Funk” on Facebook, find out if that would be ok with his parents. Running personal errands seems convenient when you’re already shuttling kids around town. However, you’re getting paid to take care of the family, not your own interests. If you have an hour to kill after you drop the kids off at dance class, ask your employer if you can pick up groceries or dry cleaning for them. 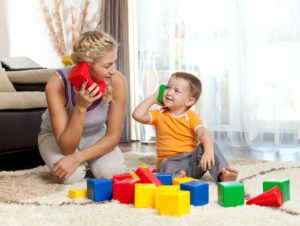 If the parents don’t seem to have any ideas, ask if it would be ok to take care of a few personal tasks. I say this because God forbid something happens while you’re out running your errands, how do you begin to explain that to the family?! Don’t forget that a successful nanny-family relationship is based on crystal-clear policies. Parents want to know that their hard-earned cash is being used for a productive purpose. Your employer pays you to be involved with the children, whether they’re playing at the park or doing homework. That doesn’t mean that you have to hover over the kids every second, but you shouldn’t bring them to a play date just so that you can scroll through your Instagram feed or as an opportunity to chat all day long with your friends. Even if you think that kids should be raised a certain way, don’t judge. If you have a background in early childhood education, psychology or have experience with certain methods that have produced amazing results, the family might appreciate your insight but make sure your feedback or opinion is as constructive as possible- not judgemental. Relationships should never be based on assumptions. Showing that you’re open to discussing complicated situations without getting dramatic will help your employment run smoothly. I love messy places says no one ever. I am sure your nanny family will be highly impressed that you and the kids drew a replica of Leonardo da Vinci’s Mona Lisa, but they sure won’t be pleased to find the paint brushes littered all over the place. Please clean up after yourself and your charges.